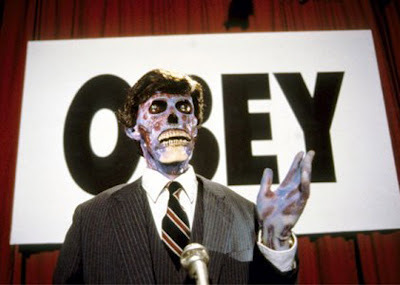 They Live was an 80s film about an alien ruling class that controlled the world through subliminal messages until professional wrestler Rowdy Roddy Piper messed everything up. He found special sunglasses that let him see through the messages – all the billboards and advertisements said “Obey” and “Conform” and things like that. I thought of this film while going through the Pillars of Salt readings. Mather points to nonconformity (not going to church) and disobedience (not obeying parents) as the start of criminal careers. I can see some self-interest in that message, since Mather was a leader in the community and the church, but I think his intentions were genuine. He wanted to save souls, and the Puritans wanted to build a better society in the New World. Execution sermons were a means of social control – making an example and a lesson of the people being executed. At the same time, there’s a bit of hypocrisy in it, as they chafed against British rule. Deposing governors and revolting do not really qualify as being obedient. The scriptural quote “Render unto Caesar that which is Caesar’s” as I recall was specifically about taxes, but could be interpreted more broadly as a commandment to be obedient to earthly authorities. Yet the Revolution was basically a tax revolt. A big challenge to conformity was the huge population growth. This US History Timeline shows a 72% population increase over the first two decades of the 18th century, an increase that was reflected in Boston. That’s more than just Puritan births. There were outsiders coming in as well. There was an active effort to suppress Catholicism, which may have been a reaction to that. I wonder if crime narratives still try to foster conformity and obedience. Or perhaps something more? Pinker says there’s a disconnect between the perception and reality of violence in society. Yet we have growing regulations and constant calls for growing budgets for military, police and prisons. I wouldn’t be so paranoid as to suggest that there’s some central control, like the aliens in They Live, but it seems like there are those who stand to benefit when the people in general feel uneasy and unsafe. This entry was posted in Uncategorized and tagged they live, true crime. Bookmark the permalink.